Note Anytime is a free note taking app that is used for taking notes, and then saving and sharing those notes. It’s more than just being a simple note taking app because it lets you add annotations to PDF documents and images, and draw sketches using its interesting built-in tools. You can also use it for digital scrapbooking or for playing games like hangman, tic-tac-toe etc. It includes cloud storage and you can store and retrieve notes later to read. You can also email the notes, or share them on Facebook, Twitter and Tumbler. The app is developed by MetaMoji Corporation and is available for Apple, Android, and Windows8. You can find this free app inside the Productivity Category in Windows Store. Follows a screenshot of a note opened in Note Anytime. You can download this free note taking app by clicking here. Click on “View in Windows Store” button, this opens the apps page in Windows Store. Finally, click on the Install button. This downloads and installs the app on your system. When you launch the app, you’ll see a plain white page. You can choose to start taking notes in the same page right away, or choose from different page models provided by the app (such as card, rule, calligraphy etc.) and open the selected page as a new page. Click on the back arrow button at the top left corner of the screen (see above picture) to go back to the main interface of Note Anytime. Now the window looks like the following screenshot. From the left side, you can explore and select the desired folder under which your notes will get stored. You can also create or delete folders. Just select the folder and make right click on it; you’ll get options to create and delete folder, just click on the requisite one. The rest part of the screen shows all the notes and folders inside the selected folder (or directory). You can search for a note using the Search button. Sort button is used to sort contents (based on tags) and Tag button is for adding tags to notes. To create a new note click on Create Note button and then select the page model. By default all tools are disabled. To name the note file, click on the No Title label (top left side) and then give desired name. Click on the pen tool (the only tool on the screen) to enable all tools. Following is a screenshot of same page before and after clicking on the pen tool. Pen tool: This tool lets you draw or write with free hand. You can set the style by clicking on the available style buttons (buttons that looks like ‘S’ around pen tool). Select a style (continuous, dashed, dotted, etc.) and make a right click. This opens a small window on the right side of screen. Choose a desired color, brush thickness, and click on Done. Then start drawing with selected pen. Text Tool: This tool lets you write texts on the page. Select the tool, click on the page area where you want to write the text, and start typing. You can change the font style and color later by selecting the text using the selection tool and then right clicking and choosing desired option. Selection Tool: This tool lets you to select the elements present on the page and then move, arrange, resize, remove, and rotate them. You can select either a single element just by clicking on it, or a group of elements by drawing a free hand selection area. Select an item and you’ll get the controls to rotate, resize, and move the selected item. If you want more controls like color, font, bring to front etc., then do right click. The right-click options depends on the item which is being selected. Eraser Tool: This tool is used to erase elements. It is a free hand eraser. In Note Anytime, a note can be of multiple pages. To add a new page to the note click on the Plus button (top left side of screen), and choose Add page or Add page with paper. If you choose Create note from the list then a new note gets created removing the note on which you were currently working, so save current note before clicking on this option . And if you choose the Create from current note option then a copy of current note gets created. The tools present on the top right corner are used for adding images on the note from PC, saving notes, or sharing the notes via email, Twitter etc. The notes gets saved in .atdoc format. To jump between notes, you can use the jumping buttons (bottom left side of screen). The button present at the bottom left corner shows thumbnail view of pages. You can also zoom in a particular area and edit your sketch in the same mode. 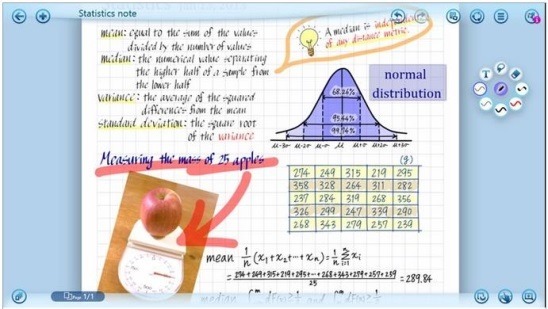 Free Windows 8 app to take notes. You can also use it to draw or sketch. You can use it to add annotations to important pdf documents and copyright them. Can add funny annotations on images and share on social networking sites. Includes cloud storage with automatic backup and synchronization service between different supported devices. Allows reading pdf documents and saved notes anytime. Allows sharing on Facebook, Twitter, and Tumbler. Easy and fun to use app. Note Anytime is a good note taking app. You can use it for multiple purposes. There are various controls and buttons that makes it a flexible note taking app. Though the interface is unique and takes some time to get used to. But still it’s a handy and useful app.